Birthplace : Hammersmith, west London, U.K.
Gary Numan (born Gary Anthony James Webb) is an English singer, composer, and musician, most widely known for his chart-topping 1979 hits "Are 'Friends' Electric?" (as Tubeway Army) and "Cars". His signature sound consisted of heavy synthesizer hooks fed through guitar effects pedals. Numan is considered a pioneer of commercial electronic music. His use of themes from science fiction, and his combination of aggressive punk energy with electronics, have since been widely imitated. His smash single "Cars" spent weeks on the charts in 1980 and paved the way for an entirely new genre of "alternative" music. Spurning the rawness of punk for a slicker, catchier, production-heavy sound, Numan, wrote Guardian writer Dom Phillips, "was Britain's first ever synthesizer star, staring coldly at the camera, covered in white make-up, singing in his nasal monotone about isolation, aliens and robots." 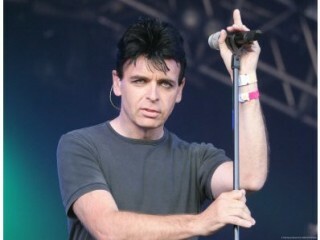 Numan was born Gary Anthony James Webb on March 8, 1958 (some sources say 1959), in London, England. He grew up near Heathrow Airport, where his father worked as a baggage handler. Although he claimed to have little serious interest in music until his late teens, he was admittedly fascinated by technology and harbored an early ambition to fly planes. "I taught myself to play guitar," he told Lisa Verrico in a 2001 interview with Scotland on Sunday, "but I was always more interested in noise than actual songs." For a time, he wavered between music and flying, but he soon realized, he admitted, that "the academic qualifications to be a pilot became more and more daunting. One I had to be brainy for, the other just lucky." Numan's academic career was further hampered by his expulsion from two schools for disruptive behavior. He wound up working in an air-conditioner factory for a time, then drove a forklift in a warehouse. Still interested in music, he answered a 1976 ad in a music trade paper for a guitarist, and won the job in a group called the Lasers. "There were three in the band and only one of them liked me, but I not only got in, I took the band over from day one," he told Verrico. With Paul Gardiner, the Lasers' bass player, and his uncle, drummer Jess Lidyard, Numan formed Tubeway Army, a synthesizer-heavy act inspired by the sounds of experimental German rockers Kraftwerk. Still, he was not entirely enthused about the electronic music being made then. He told Guardian journalist Will Hodgkinson, "I always associated it with men wearing capes standing on ice rinks, so I wasn't into it at all. But I ended up in a studio and there was a Mini Moog left behind. It had been left on this heavy bass programme, so when I pressed the keyboard this huge sound came out of it, and so it was pure chance that changed everything." Tubeway Army recorded some singles for the Beggars Banquet label that were not released until some years later as Plan. Their eponymous first LP, a Numan-authored mix of punk and glam-rock on which he sang and played both guitar and keyboards, appeared in late 1978. By this time he had changed his name to the more futuristic-sounding "Gary Numan" and fronted their stage shows as a chilly, alien-esque persona. Rechristened "Gary Numan and Tubeway Army" for Replicas, their second release in 1979, their single "Are 'Friends' Electric?," with its compelling hook and buzzy production sound, rocketed to the top of the British charts, where it remained at number one for four weeks. "Even today, its electronic drone sounds powerful," wrote Phillips in the Guardian. "In 1979 it landed like a bomb in the dour, post-punk musical landscape." Replicas was quickly followed by Pleasure Principle, and its massive hit with its single, "Cars" helped launch Numan and the band in North America as well. The track became one of 1980's surprise hits and one of the first "alternative" numbers to break the top ten. Numan's odd, robotic stage presence only added to his allure as a "replicant," a sci-fi synonym for "android." Actually, Numan told Scotland on Sunday, he had terrific stage fright and was simply too frightened to do anything but stare blankly. "I am quite detached by nature," he explained to Verrico. "There's a recognised medical syndrome which is basically an inability to interact with other people. I have a mild form of that. I find it hard to have conversations that aren't about anything in particular." He elaborated further in a 2003 interview with London's Independent newspaper, telling journalist Fiona Sturges that he suffered from Asperger's syndrome. "It means I don't say things in the way that other people would," he told the paper. "I might say things in an abrupt way and therefore seem cold and uncaring. This interview is fine, because our relationship is clearly defined and I know exactly what's expected of me. But if you met me at a party, I probably wouldn't know what to say and you'd think 'what a miserable sod.'" In Britain, Numan was a bona fide pop star, but critical assessments, from a generation of music writers who were ardent rock and punk fans, were often scathing. They mocked his odd persona and massive following, including the fans that copied Numan's hairstyle and clothing. Accused of ripping off David Bowie's arty stage concepts, he was once asked to leave the building when he stayed after a recording session to watch Bowie work. Both he and his family were the target of death threats; his father discovered a gasoline bomb beneath his car, and authorities deemed a kidnap threat to his mother credible enough to place her under police protection for a time. Numan said that his fame became a terrible burden. "People used to walk down the street and shout 'wanker!' at me," he told Sturges in the Independent. "I'd think, 'How can you say that? You've never even met me.'" Telekon was Numan's third LP to reach number one on the British charts, but in 1981 he announced he would end his live performances. He had trained as a pilot by then--an accomplishment that the British music press also mocked as pretentious--and embarked on a round-the-world jaunt. The plane ran into mechanical trouble in India, and Numan and his pilot were forced to make an emergency landing. Because both wore two watches and had cameras with them, authorities arrested them on charges of smuggling and spying, and detained them for four days until the British Foreign Office became involved. Numan began to experience bad luck with his music career as well. His records lost sales to a raft of post-punk, new-wave, New Romantic acts emerging in England at the time such as Echo and the Bunnymen and The Cure. The song "Warriors," from the 1983 release of the same name, was the last of Numan's new releases to make it into the top ten. Leaving Beggars Banquet, Numan founded his own label, but ran into severe financial difficulties when its releases failed to sell. A promising deal with IRS Records turned contentious and furthered hampered his career. By the early 1990s he owed $1 million and was nearly forced to declare bankruptcy. This launched a period of intense introspection for him, and when he began to write songs again, "I abandoned all ideas of chart success," he told Remix's Ken Micallef. "That is when this huge weight lifted. My music became much heavier and darker." The result was Sacrifice in 1994, which brought out a more industrial side of Numan's songwriting, and surprised the few critics who reviewed it. The true rebirth of Numan's career began in the years just after Sacrifice. He had stopped reading the music press years before, telling Verrico, "I couldn't cope with being slagged off any more. It was too depressing." He was surprised, however, to hear from others that some well-known musicians were mentioning his work and even covering some of his early classics. Nine Inch Nails's Trent Reznor admitted to listening to Telekon every day while recording his seminal 1989 debut, Pretty Hate Machine; shock-rocker Marilyn Manson covered "Down in the Park," a proto-goth tune from Replicas for the B-side of his 1995 single "Lunchbox." In 1997 musicians--including Damon Albarn of Blur--put together Random, Volume 1: A Gary Numan Tribute, which featured three versions of "Are 'Friends' Electric?" Numan still pilots his own plane, which he keeps near his home in Essex, England. He wed one of his longtime fans, Gemma, in the late 1990s, and wrote a 1997 autobiography, Praying to the Aliens. Despite swearing off live performances, he still tours occasionally to support studio efforts like Pure, a 2000 release that earned enthusiastic critical accolades. In his Remix interview he contended that pursuing his own musical direction had probably saved his career, in the end--even if it nearly brought him to financial ruin. "I picked up a lot of respect for not doing the nostalgia thing," he told Micallef. "I did something I was told was suicide, and I was much better off than when I was on a major label and failing. I figured I was finished anyway, so I had nothing to lose." Numan contributed vocals to four tracks on the April 2007 release of Fenton's debut solo album Artificial Perfect on his new industrial/electronic label Submission, including songs "The Leather Sea", "Slide Away", "Recall" and the first single to be taken from the album, "Healing". The second single to be released in the UK was "The Leather Sea" on 30 July 2007. He sold out a fifteen-date UK tour in Spring 2008 during which he performed his 1979 number one album Replicas in full, and all the Replicas-era music including B-sides. The highly successful tour also raised Numan's profile in the media again due to the fact that it coincided with his 30th anniversary in the music business. View the full website biography of Gary Numan.